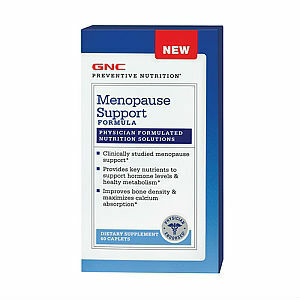 GNC Preventive Nutrition Menopause Support provides overall health support to menopausal women and takes care of major hormonal or age-related healthy concerns like hot flashes, night sweats, osteoporosis, reduced sexual arousal, forgetfulness, mood swings and irritability. Hormonal support – Sophora japonica fruit extract, black cohosh, and hops provide relief from menopause symptoms as they contain plant estrogen, which allows the body to adjust to lower natural estrogen levels better. The formula also contains GLA, which a precursor of prostaglandins, and helps regulate hormone levels in the body as well as ensure proper functioning of the circulatory, nervous and immune system. Bone and circulatory support – Vitamin D helps in proper absorption of calcium. MBP or milk based protein allows maintenance of healthy bone mass and Gingko biloba prevents erosion of bone and reduction of bone density. It also keeps the heart healthy. Energy and metabolism management – Minerals like chromium, iodine, magnesium, zinc and copper are required for proper functioning of the body. Essential vitamins and minerals are required for metabolism and for repair and production of body cells. Daily dosage for this product is 2 caplets a day, one in the morning and one in the evening. This supplement contains milk protein and may cause allergic reaction in lactose intolerant people. A month long supply of this product costs $49.99. Members of the website are offered a discounted price of $44.99 for pack. The company has a 30-day return policy for all its products and offers full refund if you are unsatisfied with the quality or effectiveness of the supplement. While this is a good, wholesome product made of natural ingredients. It contains many active ingredients and provides multiple benefits, it does not have separate day and night variants to cater to the body’s different needs during the night and day. Jackie Horowitz	reviewed GNC Preventive Nutrition Menopause	on August 9th	 and gave it a rating of 2.